Trick-taking games often feel nostalgic to me. I remember learning Hearts and Rook as a kid and have known so many people that played this style game in the past. 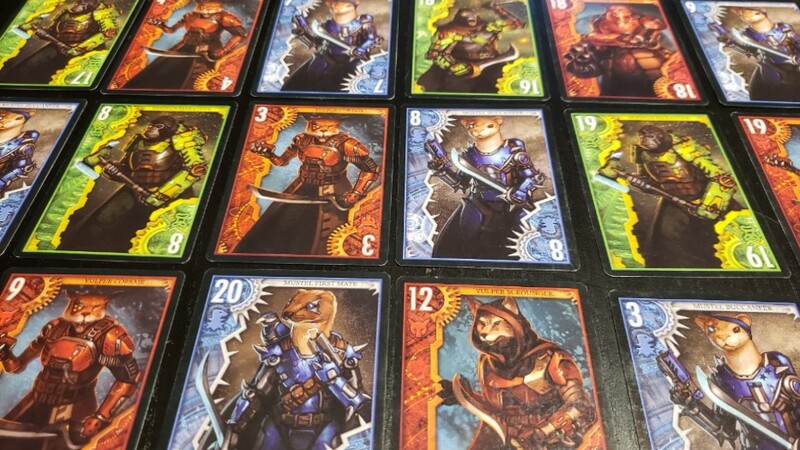 Pirate Tricks is a new game from Soaring Rhino Games that adds a bidding element to the trick-taking formula. Let’s take a look at what makes this game stand out from other games in the genre. Players are given a hand of 5 cards, a bidding board, 12 coins and a screen to hide their bids. Pirate Tricks is played in 3 rounds with each round having a specific set of guidelines. This leads to lots of variations from game to game but also it means there’s a learning curve for new players to wrap their head around. Two Recruitment cards will give players perks for owning specific cards based on color, number or both. Treasure and Capture cards will give you the goals for the round. Treasure rules will award coins for the most tricks, the fewest tricks, or other combinations. Capture cards give you bonuses or punish players for capturing specific colored cards, or numbers during the round. Since these cards refresh each round, there is always a new goal. While you were competing to win tricks in round 1, you may want to lose every trick in round 2 because of the new rules on the table. I really enjoyed the variety of cards in these decks. At the start of each round, rows of cards will be laid out in the middle of the table. 5 cards are face up and 2 are face down. Players will start the round by bidding their Loon, the coins in the game, in order to take those cards into their hand. This is where Pirate Tricks really changes up the formula from your average trick-taking game. Instead of being at the mercy of the hand that you are dealt, player have to decide what cards suit them best and spend money to build their hand. Bidding for cards in this game works really well, unless you’re broke. Losing your money in Pirate Tricks can definitely make you feel helpless at times. This comes because you over spent in the bidding phase of an earlier round or because you just didn’t plan well when the new Treasure and Capture cards came out. In many cases, losing all your money isn’t a result of random card dealings and that’s what I like about this game. Pirate Tricks had me coming back round after round saying, “I know I can do better”. I have control over what I bid on. I have options at the start of each and every round. That’s what makes this game different than other trick-taking games I’ve played. Players have to discard 2 cards from their new hand taking everyone down to 10 cards. You’ll get Loon based on meeting the criteria on the two Recruitment cards, but you’ll have to show everyone at the table the cards that match the criteria. Players with a good memory will have a definite advantage going into the round. The basic rules always remain the same for winning a trick. The active player plays a card that contains a color and number. Then players play cards face up around the table to beat the high card and “win the trick”. Red is the “trump suit” and can be played when you don’t have the color of the suit that is currently in play. Players can choose to lead a hand with blue, green or red, but players have to follow with that color unless they don’t have it in their hand. In a case where 17 Green, 12 Green, 4 Red and 8 Green are played, the player with the red card would win the trick. Just like most trick-taking games, the theme for Pirate Tricks could honestly be anything. The card art is well done and the characters have a futuristic appeal. The actual trick-taking mechanics are straight forward, simple and nothing new. 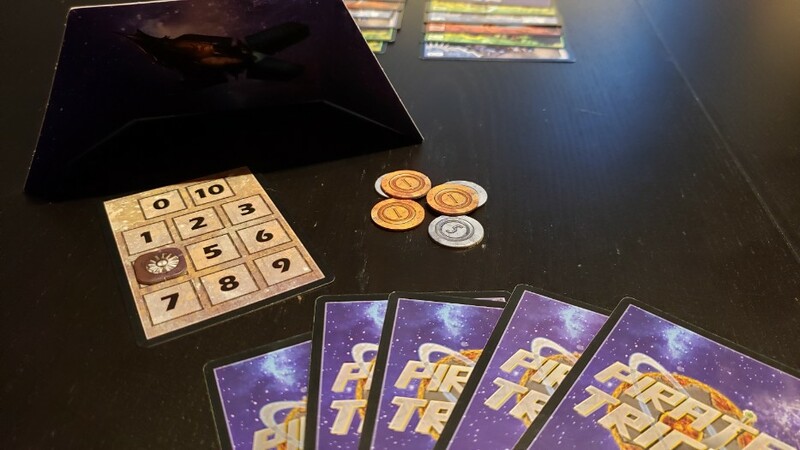 The setup, bidding and scoring mechanics end up being the meat of Pirate Tricks. If you already have a good variety of trick-taking games, I’m not sure this is one is a “must own”. 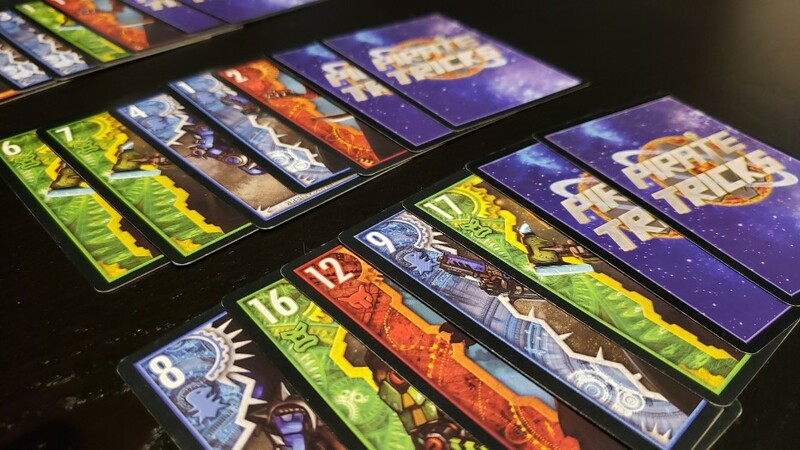 If your game shelf is a missing a good trick-taking game, Pirate Tricks is one that’s definitely worth your time. You can pick up Pirate Tricks at your local game store or purchase a copy today on Amazon. Soaring Rhino provided us with a retail copy of Pirate Tricks. This in no way influenced our opinion on this game.